Sick of sinking mattresses? The Emma mattress is very responsive, adapting to your weight to give you plenty of support without being too firm. This hybrid mattress could be just what you’re looking for! The great thing about the Emma mattress is it gives you the comfort you need, you do feel as though it is adapting to your body shape and size, but without leaving you feeling as if the mattress is eating you! If you have trouble getting in and out of bed, you need a mattress like this. What is the Emma mattress made of? What are people saying about the Emma mattress? What do we think about the Emma mattress? At first glance, the Emma mattress looks pretty ordinary, but we’ve had the chance to look under the cover and see exactly what makes up the Emma mattress. There are four layers in total, giving you a standard 25cm deep mattress that should fit any bed frame. The lowest layer is quite unusual and innovative. While many mattresses simply give you three or four centimeters of base, this mattress offers a huge 16 centimeters of highly supportive foam. The unique wave design allows it to compress, yet still support. Above this supporting layer is a layer of memory foam. This is 3 cm thick. You might think it rather odd that the memory foam is located near the bottom of the mattress, but it actually works very well to give you a contouring layer, as well as providing a buffer between the base layer and the coil layer above. Next on our way upwards through the Emma mattress is a layer of microcoils. This is only 2cm deep but it’s very effective. These coils are well known for relieving pressure, as well as allowing the mattress to dissipate heat, so you’ll never feel too hot in bed. The coils add a little bit of spring to the bed which is ideal for those who find memory foam just not boingy enough! FInally, we have a good 4 cm of responsive poly foam. Similar to latex foams, this gives you pressure relief, along with extra cooling and some added bounce. When you look at the cover of the Emma mattress, you’d be forgiven for thinking it was rather low quality, due to the thickness of the polyester used. However, this has actually been done on purpose. It’s thin to enable the layers of foam to breathe. This will keep the mattress cooler, and prolong the life of your mattress. Emma mattresses are reasonably priced, starting at £349 for a single. The double comes in at £549 and the king size is £599. The largest of all, the Super King is a decent £699. However, do check out their website as there are often discount vouchers available. There are eight size options with the Emma mattress. Choose from single, small double, double, EU single, EU double, King, EU King or Super King. Ease of ordering and quick delivery speed – Ordering an Emma mattress is very easy. You’ll also get it delivered next day, free of charge. When your Emma mattress arrives it will be compressed in a box and is not too heavy, making it easy to move into the bedroom ready to unpack. Free trial and good warranty – You can use your Emma mattress for up to 100 nights and still send it back for a refund if you’re not happy with it. This is a great idea as it can take a while for our bodies to adapt to a new mattress. If you’re not comfortable after 100 nights then this isn’t a case of adjusting to a new mattress, it simply does not suit you. This can be an expensive mistake with some mattresses, but with an Emma mattress you can just send it back and get a refund. There’s also a 10 year warranty on it. Not only does the Emma mattress get great reviews on Amazon, but it’s also been selected as a Which? Best Buy. 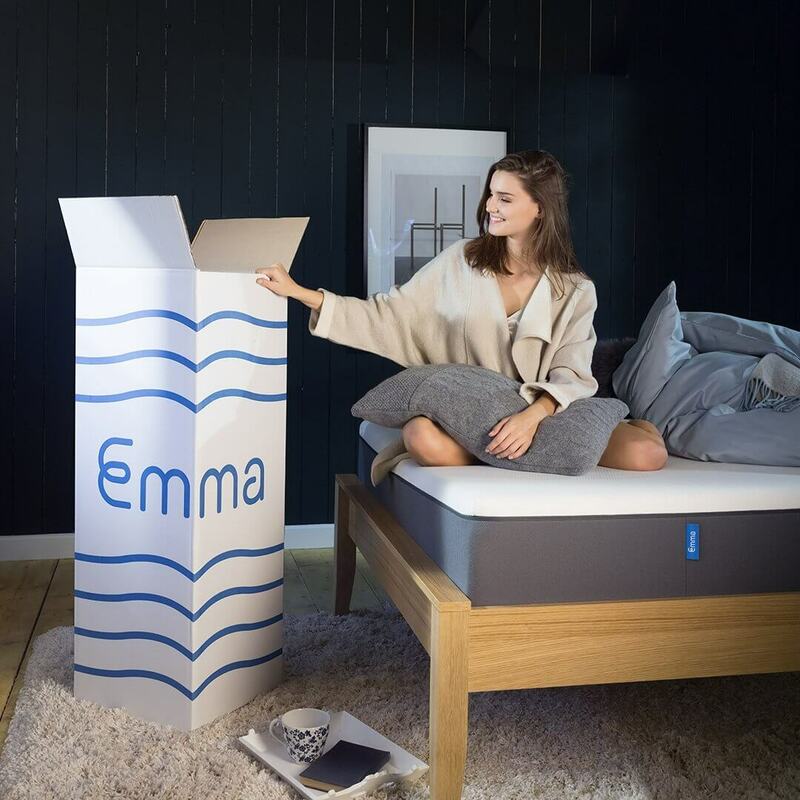 “Have been trialing the EMMA Mattress for two months now I can honestly now say that I’ll shall be keeping this one, having trialed both the LEESA and the OTTY. Item was unpackaged and allowed to fully inflate through the day before use, first thing we noticed was no chemical smells. We struggled to find any negative reviews of the Emma mattress, however there is one point worth mentioning. The Emma mattress is only suitable for those weighing up to 20.5 stone, so if you weigh more than this, you might find you aren’t as comfortable on the Emma mattress as you would be on a mattress that is made for heavier people. We loved the high quality stitching on the cover, it’s certainly not going to fall apart at the seams. The other thing that impressed us with the Emma mattress, and that we felt made it different from other mattresses, was the pure cosiness of it. You can certainly imagine being very comfortable and snug on a cold winter’s day on this mattress. The cooling system works well, so this a great mattress for anyone who tends to get too hot in the night. The firmness is rated at 6 out of 10, so if you like a mattress that is either very soft or very firm, this may not be ideal for you, but if like an average firmness, this could work well.